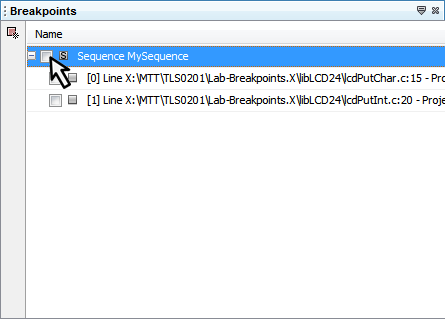 You can disable sequence breakpoints that you have set so that they will be remembered by MPLAB® X IDE, but will no longer affect the program's execution. They can be re-enabled when you need them again. 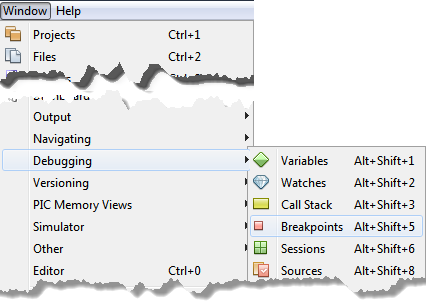 Uncheck the box next to the sequence breakpoint you want to disable. The IDE will remember its settings, but it will not affect program execution. You can also disable just an individual breakpoint within the sequence by unchecking its box while leaving the sequence's box and all its other children's boxes checked.